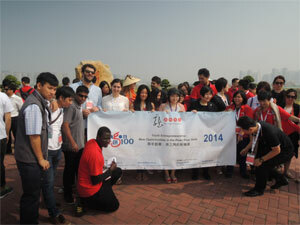 The Qianhai Authority, Shenzhen Youth Federation and the HKFYG initiated the E Hub. A move-in ceremony will be held for the 20 teams nominated by the Youth Business Hong Kong (YBHK), an entrepreneurship support scheme of the HKFYG. b. Launching Ceremony of "Dream Plus Alliance"
Initiated by the E Hub, "Dream Plus Alliance" is a group connecting a hundred of start-up related institutes, including international associations, financial institutes, business incubators, start-up ventures, start-up training, media companies, tertiary education institutes and production and research bases. With an aim to be a platform for exchange, learning, growth and new listing, it is the first alliance tailor made for Shenzhen-Hong Kong youth entrepreneurs. Added to the lunching ceremony of the Alliance, there will be a move-in ceremony for all HK start-ups and “A Dialogue Session of Shenzhen-Hong Kong Young Entrepreneurs and Investors”. Working on the theme, “Growing Entrepreneurship – What Next?”, the Global Youth Entrepreneurs Forum will bring 500 young entrepreneurs from overseas, Mainland China and Hong Kong and will facilitate their gaining practical tips to enhance the sustainability of their businesses as they develop peer networks. Firstly launched in 2014 with over 400 young participants and speakers from over 22 countries and cities with overwhelming response, we are very pleased to organise the Forum again this year. This two-day Forum will be a perfect opportunity for startup experiencing and for exploring the global business trend and the China (Guangdong) Pilot Free Trade Zone. A good chance to explore business opportunities at E Hub, the hot spot for start-up companies at Qianhai, Shenzhen! Visit the Entrepreneur Day to meet the staff of E Hub and The Hong Kong Federation of Youth Groups! A thematic talk will give you tips on seizing business opportunities in Qianhai. The Hong Kong Federation of Youth Groups will provide information about the Qianhai Shenzhen-Hong Kong Youth Innovation and Entrepreneur Hub (E Hub) which promotes youth entrepreneurship in Qianhai. Copyright © 2019 The Hong Kong Federation of Youth Groups. All rights reserved.